Not familiar at all with Knight Area, symphonic rock collective led by Gerben Klazinga, I expected something in the grand Dutch tradition of Ayreon. Perhaps the previous three albums were more in the symphonic vein, I’d let it up to you to discover, but the new album Nine Paths is quite a bit more about the progressive rock/metal than anything symphonic. It seems that bringing out something edgier and a bit more streamlined was actually Knight Area desire, having paired themselves with Neil Kernon during the production of Nine Paths. 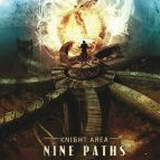 One needs to settle into a mellower mode before listening to Nine Paths and have patience and understanding, with a full realization that this is the music not to be throwing horns to. If anything, the 3 minutes intro to the opener Ever Since You Killed Me is as sunny and bright as you can possibly have it on the song which has the word “killed“ in its title. Throughout the album, these Dutchmen present their vision of twisted and ornate prog metal. It is possible to qualify the riffs of Summerland and Clueless as something harder and rocking, but none of these bite too hard. What is remembered, however, is a warmer bass tone, the great interplay between bass and keyboards (Summerland), the superb attention to detail and overwhelming instrumental ability. You can try to paint the stripes on a tiger into a solid tone, but you can’t take skilled musicians out of Knight Area. They might be after a burlier riff on Clueless, but the protracted guitar solo dominates. The snappy and jazzy prog of Pride and Joy makes pretzels from the keys/guitar back and forth exchange. These long instrumental sections, present throughout and impressive in their execution, make anything but a straightforward listen out of Nine Paths. There are bursts of energy (Wakerun after it is done with its acoustic part), but there is plenty of wishy-washy narratives, as in the closing semi-ballad Angel’s Call. So, if the intent was to rock and shake the listener, I can’t say my senses were entirely shuddered by Nine Paths. At least where melodies were more direct (The River) or symphonics used to a wider degree (The Balance), those cuts were certainly livelier and snappier. The androgynous voice of the male vocalist Mark Smit does not help with the passion either. The softness of his voice is mostly noticeable on what the band probably considered their nicest vocalized piece, the duet between him and Charlotte Wessels from Delain on Please Come Home. When the edge is blurred between a male voice and Charlotte’s I have to admit that such gentle and touchy approach to singing in metal is not my cup of tea. While it is undeniable that skill level poured into the album is terrific, it is the emotional charge of Nine Paths which I found lacking, leaving the overall impression of the album as a “nice piece of music”.